Update: The Flash Flood Watch for Fort Bend County is Extended Until 4 p.m. Friday. Bands of showers and isolated thunderstorms will be moving through the upper Texas coastal waters and inland today. Given the already saturated conditions, street flooding is likely with some isolated flash flooding also possible where the heaviest rains occur. 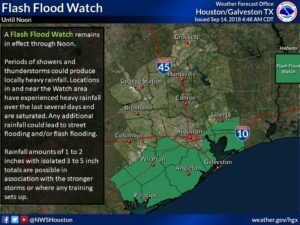 The National Weather Service has issued a Flash Flood Watch for several counties including Fort Bend until noon today (Sept. 14, 2018). More rain is predicted throughout the weekend; be cautious when travelling in the region as street flooding is possible in some areas. Remember, Turn Around Don’t Drown.